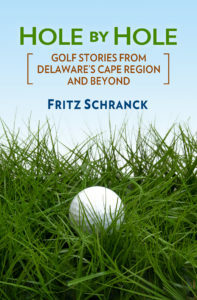 On March 23, standing next to the ninth green at Rehoboth Beach Country Club, I checked my phone’s weather app as a small knot of family and friends walked up the ninth fairway. 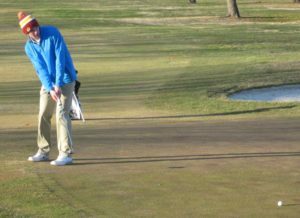 Two Cape Henlopen Vikings were playing their Lake Forest competitors on the challenging par-5. It was 39 degrees, with a wind chill registering 29. Nolan Brown chips toward the hole from above the ninth hole. The golf course had to be even colder than that, however. The wind was blowing at well above 10 knots directly off Rehoboth Bay, into the faces of the players and those watching them in the early evening. The cold weather made for an impressive 166-298 victory over the Spartans, especially considering this was the Vikings’ first formal match of the season. Junior Nolan Brown and sophomore Dane Palmer carded a pair of 4-over par 40s for co-medalist honors. “I played pretty good in these conditions,” Palmer said. He birdied the par-3 fifth hole, and parred the third, fourth, and nineteenth. Brandon Mays-Harp felt “really good” about his 41. “I just tried to play bogey golf,” he said, but the junior actually parred several holes. Dane Palmer watches as his putt tracks toward the hole on the par-5 ninth hole. Senior Matt Zehner completed the team scoring with an adventurous 9-over par 45. “I had a good start,” he said, with an opening bogey and then four straight pars. 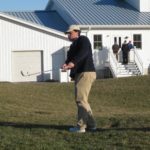 Unfortunately, he dumped two balls in the water on the sixth hole, and then flew his tee shot over the green into the bay on his last hole, the nineteenth. “I kinda limped in,” Zehner said. Congratulations and best wishes to Sarah Lydic of Ocean View for her upcoming performance in the National Drive, Chip and Putt Championships, to be held April 2 at Augusta National, home of The Masters Tournament. The televised event sets 80 children—40 girls and 40 boys—in a skills competition in four different age categories. Lydic qualified for the nationals after winning her group at Oakmont Country Club in Oakmont, PA.
Lydic is 11 years old, and a fifth grader at Lord Baltimore Elementary School. She and her sister Hannah are members at Bear Trap Dunes, thanks to generous sponsorships from fellow members. Coverage begins at 8 a.m. on The Golf Channel April 2. Like many other sports, golf can create several kinds of repetitive stress injuries and other ailments. Some folks choose to deal with these aches and pains by swallowing a few pain tablets and hoping for the best. Others take the hint, and lay off the golf for a few days to let the muscles and tendons recover. There are other ways to handle these nagging problems, however, including the careful use of anatomically correct supports, to help prevent the injury in the first place, or to relieve some of the results of playing through pain. The Zamst company, of Irvine, CA, focuses on creating sport-specific support devices to provide what they call structure and reinforcement for elite athletes and the rest of us. At the 2017 PGA Merchandise Show I met Bryan Smeltzer, Zamst’s general manager, a former football player for the University of Nebraska. Thanks to his own bout with athletic injuries, high impact activities are no longer something he can do, so he makes up for it with mountain biking. Prior to Zamst, he also worked with golf glove companies, and therefore has a trained appreciation for proper fit and design. In the golf category, Zamst offers 13 different supports or wraps, aimed at problems from the shoulder down to the feet. There are shoulder wraps, back supports, icing systems, and compression sleeves. According to Smeltzer, the biggest sellers for the golf segment relate to the elbow, knee, and back. He said these three areas cause the most problems for the most golfers, an assessment affirmed in several books I’ve reviewed concerning the medical side of golf. The MK-3 Knee Brace provides ligament support, a kneecap stabilizer, flyweight design, and ventilation cooling using what Smeltzer called “breathable neoprene.” The P-Tech Elbow Band dissipates and reduces irritation on the arm tendon that otherwise creates tennis/golf elbow problems. 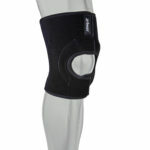 The JK-Band is a narrow band that grips the leg below the knee to address patella tendonitis. Smeltzer also said the company’s ZW-5 Back Support is very well received by golfers and trainers. It permits an individualized fit, has ventilation cooling, and does not impede freedom of movement like other braces. Smeltzer said he was happy with the reception that Zamst HA-1 Short sock is receiving. This performance sock, featuring flexible molded inserts, helps golfers deal with plantar fasciitis during their rounds. As with any such devices, a discussion with your physician to confirm the diagnosis and treatment before leaping into this technology is a good idea. What you think is a minor sprain may be masking a far more serious condition. Zamst products are available at the PGA Tour Superstores, green grass pro shops, and online.